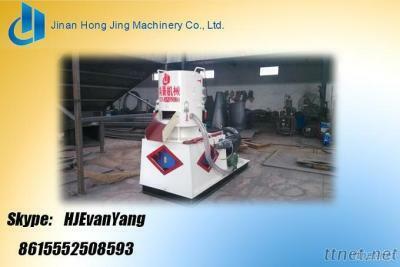 A new generation flat die multifunctional pellet mill is applied to the materials with adhesiveness and shaping. Main engine with high standard reducer drive, transmission part selecting high quality bearing, ensure that the transmission efficiency, stable, low noise and long service life. Spindle and roller equipped with automatic lubricating system, can continuous operation without stop. It is mainly used to produce crude fibre pellets, such as: sawdust, rice husk, cotton stalk, cotton seed hull, weeds and other crops straw, living garbage, factory waste, difficult to molding material granulating, bio-bacterial manure, organic fertilizer and compound fertilizer granulation in low temperature. 1. With reloading reducer extends the equipment of long service. 2. The type machine on both ends of the pressure roller and the die, the outer ring line speed consistent, do not appear dislocation of the wheel and die friction, reduce the resistance, reduce the kinetic energy loss and prolong the service life of the die. 3. Uniform roller setting, stable running. 4. Using central pressure regulating structure, adapting to different materials, ensure the pression effect. The sawdust, corn straw takes a lot of pressure. Roller parts are the center of the whole equipment parts, adopting high quality alloy steel and improving the service life. 5. The structure die stationary, spindle driving roller pressing materials, suitable for crushing straw particles. 6. With Φ3-30mm diameter die, the type machine produced the different kinds of pellets and achieve the best effect.